Matthew, Mark and Luke say Jesus was crucified after the Passover meal. John indicates it happened before. How do we resolve this conundrum? Jesus said emphatically that the ONLY sign he would give to a disbelieving generation would be the sign of Jonah - that His body would be entombed for three days and three nights. Yet the institutional church's "Good Friday" to "Easter Sunday" schema does not encompass three days and three nights - no matter how you calculate the period. Did Jesus exaggerate? Did He make a mistake? Did Jesus take the Jonah story seriously - and should you? Is there a missing day in the middle of Holy Week as the NIV Study Bible claims? Could all the events of the pre-crucifixion "trials" have been squeezed into the (eleven?) hours available from the arrest to the nails being driven into Jesus' body? How many calendars were in common usage in Judaea in the days of Jesus? Was John the Baptist an Essene? What six "G"s fully explain the mission, achievement and purpose of Jesus? 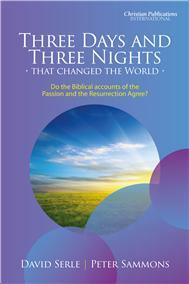 What is the theological significance of "the third day"? These and many other issues are considered and satisfactorily resolved in this valuable modern study, which provides a faith-building overview of the events of 'Holy Week' and reveals insights that will surprise and delight younger and more mature Christians alike. David Serle - a Bible student of many years with a passion for accuracy, David provides helpful short studies via davidsbiblenotes.com. He is a contributor to Sword Magazine in the UK, and part of the Foundations leadership team.He is also a leader in his local church on the Wirral, Cheshire. Peter Sammons - author of a number of books published via Glory to Glory Publications and Christian Publications International. He is a contributor to Sword Magazine. A trustee of Through Faith Missions and a speaker at the annual Foundations conferences, Peter worships at a Congregational Church in Suffolk. Ordinary Christians and Bible study leaders alike will find this a valuable resource. Evangelists involved in apologetics may encounter these sorts of challenging questions from an increasingly doubting generation - this book provides a coherent and logical argument, and concludes that the biblical accounts are consistent and dependable. For CreateSpace editions, please find the printable Holy Week timeline. In addition there is an article called "Good Thursday?" from UK magazine 'Sword' which summarises certain questions covered in the book.